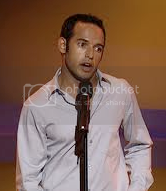 This Gemini award winning Actor/Comedian is currently the costar on the hit Fox sitcom, “The Rules for Starting Over”. He has also appeared in the feature films, “Harold and Kumar go to White Castle”, “The Ladies Man”, “Pushing Tin”, and “Purpose”. Shaun’s television career has included roles on Fox’s “24”, “This Hour Has 22 Minutes”, and “Cedric the Entertainer Presents”. Shaun is also a favorite of Montreal’s Just for Laughs Comedy festival having hosted the TV series for three seasons. One of Shaun’s most popular characters of his creation is “Raj Binder”, a Indian reporter with a thick accent who sweats profusely. Raj became a part of NHL history when he appeared in team photo after the first outdoor ice hockey game on record. Majumder was born in Burlington, Newfoundland and Labrador to a Caucasian mother from Newfoundland and an Indian father. He started his entertainment career as an announcer for the YTV game show CLIPS, and soon was hosting the network’s popular morning kids show Brain Wash, where he was known as Ed Brainbin. He also hosted the “Slime Tour” segments on the popular game show Uh Oh!. Eventually he joined This Hour Has 22 Minutes in 2003, and also hosted 15 episodes of the Just for Laughs specials on television and participated in the Comedy festivals in Montreal.